Siouxsie and the Banshees will release deluxe reissues of four studio albums, complete with remastered audio, unreleased bonus tracks, and extensive liner notes. The reissues for their 1978 debut The Scream, 1988's Peepshow, 1991's Superstition, and 1992's A Kiss In The Dreamhouse are scheduled to ship this fall. The reissues mark a continuation of an archival campaign that originally began back in 2005. 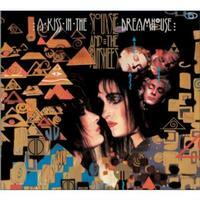 After the critical, if not commercial, success of their previous album, the Banshees returned to the studio a year later to record their fifth album in as many years, A Kiss In the Dreamhouse. Comprising the same line-up as on Ju Ju — Budgie, drums; Severin, Bass; McGeoch, guitar; Siouxsie, vocals — they produced a very different sounding record. Contains classic Banshees songs such as "Cascade," "Melt" and "Slowdive," as well as hypnotic string orchestra loops of "Circle," and the creepy cocktail jazz of "Cocoon."